Before the Internet, passwords played only a tiny role in everyday life. Think about it: Except for your ATM PIN, what important codes did you need to remember? Probably none. But now, you can’t click a link without hitting another site that requires a password. Doesn’t matter if it’s a big-name destination like Google Docs or Mint.com, or a smaller, more private site such as your local library or company intranet. You want in? Password, please. It is precisely because of these obstacles that most users do a poor job of wrangling passwords. Fortunately, it’s not difficult to change your security-challenged ways. For starters, let’s take a look at what constitutes a safe password. For shame, people, for shame. And it gets worse: In a 2009 survey, security firm Sophos determined that one-third of all users employ the same password for everything they do online. That means that if hackers get your password for one site, they’ve got it for all the other sites you use. Microsoft Password Checker. Click for full-size image. Of course, that doesn’t remedy the need to have different passwords for different sites. One viable method is to start with the name of the site, and then build a password around it. For example, for Netflix you could swap the “e” for a “3” and the “i" for a “1,” giving you N3tfl1x. Now you just need to personalize it: Tack on, say, your initials in the front and then reverse them at the end. Thus, my Netflix password might be (but most definitely is not) rbN3tfl1xbr. What I like about this approach is that it’s fairly easy to remember. The name of the site, a few letter/number swaps, and my initials for the prefix and suffix. That said, remembering your passwords is the other half of the battle. And that’s why some kind of automated solution can be a major help--especially if you want to manage and even transport your passwords, which can be very useful. If you’d rather not be bothered coming up with secure passwords, fear not! Plenty of programs and services can help you do both. Password managers like LastPass and RoboForm can generate a unique, hack-proof password for each site you visit, memorize that password for you, and enter it into the password field every time you return. All you have to do is remember a single master password so you can access the manager. In other words, one password to rule them all! That kind of data can be handy to keep in your pocket, which is why a lot of people store passwords and the like in their phones. Unfortunately, they tend to tuck this information into highly unsecure corners, like memos, notes, and contact records. If your phone gets stolen, the thief may enjoy easy access to all your secrets. No problem: Just choose a password manager that can sync with your phone. Both LastPass and RoboForm offer companion apps for BlackBerry, Android, iPhone, and Windows Phone, though you’ll need to upgrade to the premium versions if you want them. RoboForm Everywhere costs almost $10 for the first year and almost $20 per year after that. LastPass Premium runs $12 per year, period. 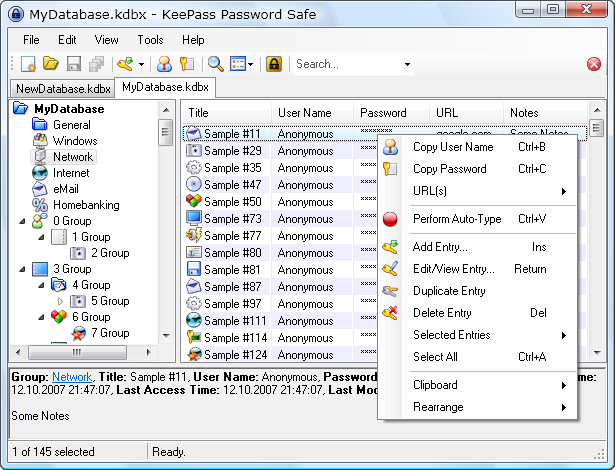 Finally, don’t forget the freebie options: KeePass is a popular password manager that can generate, organize, and input passwords. It’s not the most user-friendly tool I’ve used, especially with all the different versions bouncing around, but the price is right. Alas, you'll find no official companion apps for mobile phones, only homebrew ones that--like KeePass itself--lack meaningful support. If all this sounds like overkill, you could always set up a simple spreadsheet in Excel or Google Docs and record your passwords there. You’d get basic organization and an easy way to copy and paste passwords when you need them. Of course, you don’t want those files to fall into the wrong hands, so be sure to password-protect the Excel file you make (and any others that are sensitive). And if you use Google Docs, well, don’t forget your password!